When you hear the word contractions, you likely think about the first stages of labor when the uterus tightens and dilates the cervix. But if you’ve been pregnant, you might know that there are many other types of contractions you could encounter during your pregnancy. Some women even get frequent, regular contractions throughout pregnancy, meaning they have an irritable uterus (IU). Here’s what you need to know about this condition, when to call your doctor, and what you can do to cope. Have you felt an occasional tightening in your uterus that comes and goes throughout the day? You might be experiencing Braxton-Hicks contractions. These mild contractions may start around the fourth month of pregnancy and continue sporadically throughout. As you near your due date, you’ll have more Braxton-Hicks contractions to prepare your body for labor. This is normal. If they stay irregular, they are not considered true labor. But if your contractions develop into a timed pattern or are accompanied by pain or bleeding, contact your doctor. Braxton-Hicks contractions tend to pick up if you’re on your feet a lot or dehydrated. Slowing them can be as easy as resting, changing your sitting position, or drinking a tall glass of water. What is an irritable uterus? Some women develop frequent, regular contractions that don’t produce any change in the cervix. This condition is often called irritable uterus (IU). IU contractions are much like Braxton-Hicks, but they can be stronger, occur more frequently, and don’t respond to rest or hydration. These contractions are not necessarily normal, but they also aren’t necessarily harmful. There have not been many studies done on IU and pregnancy. In 1995, researchers explored the link between IU and preterm labor and published their findings in the . They uncovered that 18.7 percent of women with uterine irritability experienced preterm labor, compared to 11 percent of women without this complication. In other words: Irritable uterus contractions might be annoying or even scary at times, but they are unlikely to significantly increase the chances of your baby coming too early. If you search online, you may not find much information in medical literature about having an irritable uterus. You will, however, find countless forum topics from real women who deal with the contractions day in and day out. What causes uterine irritability isn’t clear either, and the cause isn’t necessarily the same in all women. Still, there are some reasons why you might have frequent, regular contractions during pregnancy. They might include anything from dehydration to stress to untreated infections, like a urinary tract infection. Unfortunately, you may never learn the cause of your irritable uterus contractions. If you suspect you may have IU, let your doctor know. Try keeping a log of your contractions, how often they happen, and how many hours they last from start to finish. You can give this information to your doctor and possibly see if there’s anything triggering the contractions. Though IU contractions aren’t considered preterm labor, call your doctor if you have more than six to eight contractions in an hour. IU doesn’t often lead to labor, but your doctor may perform an exam or ultrasound to see if your cervix is staying closed. You may also be hooked up to a monitor to measure the frequency, duration, and strength of your contractions. If your doctor is concerned about preterm labor, you may have a fetal fibronectin test. This test is as simple as swabbing vaginal secretions near the cervix and getting a positive or negative result. A positive result may mean that you’ll go into labor in the next two weeks. Corticosteroids can help your baby’s lungs mature before week 34 if early delivery is likely. Likewise, magnesium sulfate is sometimes administered to stop the uterus from contracting. You may need to be hospitalized for closer monitoring, or take tocolytics to temporarily stall labor. There are a number of ways to deal with IU. Just be sure to check with your doctor before trying any supplements. If nothing seems to help your IU, your doctor may be able to prescribe medication. Medicines that can help with contractions include nifedipine (Procardia) and hydroxyzine (Vistaril). Your doctor may even suggest you be put on bedrest and/or pelvic rest if they think you’re at high risk for developing preterm labor. 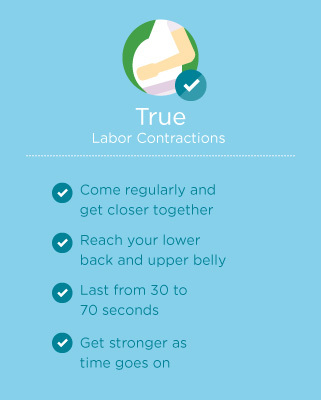 IU contractions may be uncomfortable or make you worry, but they probably won’t put you in preterm labor. Regardless, anything that feels out of the ordinary or gives you reason for concern is worth a trip to your doctor. Labor and delivery departments are used to seeing patients with questionable contractions, and would much rather confirm a false alarm than deliver a baby early.